RED Sound is pleased to announce the release of a new portable automatic DJ loop sampler/MIDI synchroniser module, SoundBITE micro. 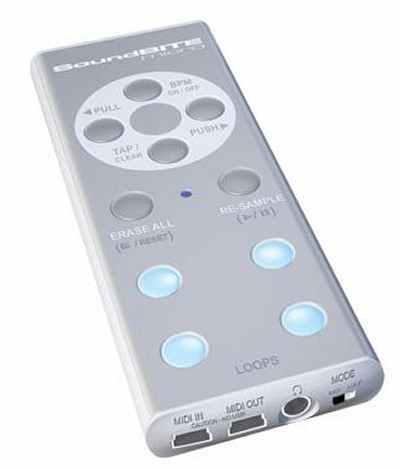 The SoundBITE micro packs many features into its compact, slim line alloy case. Loop sampler mode; offers the acclaimed looping system made famous by previous models in the Red Sound range such as SoundBITE XL. This unique looping technology allows DJ’s to instantly record and playback any combination of the 4 loop samples on offer and re-mix tracks on-the-fly. Default loop durations include 4, 8, 16 & 32 beats however, users will be able to create their own loop formats on the Red Sound website and download these custom profiles into the unit via the MIDI IN port. Featuring 96kHz sample rate / 24bit resolution, a high standard of audio quality is assured. For studio use, selectable MIDI IN synchronisation of loop playback is also offered. MIDI synchroniser mode; features the ground-breaking Red Sound audio/MIDI synchronisation system, which first came to light in 1997 in the Voyager 1 and Micro Sync models. This BPM technology has been established as the only workable “missing link between audio and MIDI” available on the market. When hooked up to popular MIDI sequencer programs such as ableton live/reason etc the results are truly amazing, allowing DJ’s/musicians to explore totally new dimensions of creativity. Featuring MIDI start, stop, continue and reset commands for the clock output, the MIDI IN facility also allows users to merge incoming MIDI data with the SoundBITE micro’s clock output (SoundBITE micro comes complete with 2 x custom MIDI cables for interfacing the on-board USB mini sockets with standard MIDI ports). Loop mode and MIDI mode can be operated simultaneously. For total user flexibility, SoundBITE micro comes complete with a built in, state-of-the- art Poliflex rechargeable battery giving up to 10 hours continuous use (or loop storage). Alternatively, the power supply/charger unit can be used to power SoundBITE micro in more permanent studio applications etc. Effects: Low-Pass, High-Pass & Band-Pass analog style filter effects in 'straight-thru' mode.